Ruger first entered the AR market a handful of years ago when they released the Ruger SR-556. The SR-556 was a good rifle, but it was also expensive, with an average price of around $1,500 if not more. Unfortunately, that’s out of the budget range of a lot of folk. But the SR-556 was also released at a time when it was rare to find a quality AR-15 rifle or carbine for less than a grand. Since then, times have changed, and quality ‘budget’ AR-15s are the new normal. One such example of a quality budget AR-15 is another product from Ruger: the AR-556. MSRP of this weapon is at $750, but it routinely sells for much lower than that. Dealers will often sell the AR-556 in the $500 to $600 range, which is very reasonable for any AR. The Ruger AR-556 also represents the most popular type of AR-15 for civilians, essentially a semi-automatic near-clone of the military’s M4 with a sixteen inch barrel and a carbine length gas system. Despite the lower price that the AR-556 is offered at, Ruger claims that it was very thoroughly tested before its release. Ruger is known for making very durable guns that can be put through hell and back and still function reliably. Subsequently, the AR-556 was tested with over 250,000 rounds in an endurance test conducted by Ruger, using a variety of different bullet types. The AR-556 suffered no malfunctions of any kind during that testing and maintained its accuracy throughout the process. Needless to say, at a price point of $500 or a little more, that is some very impressive results. In essence, the AR-556 is an AR-15 for anybody: a quality firearm at a low price that most people will be able to afford. Ruger built the AR-556 using a medium contour and cold hammer forged 4140 chrome steel tube barrel. 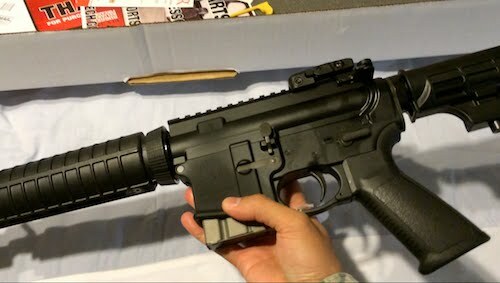 They also installed the barrel with M4 feed ramp cuts and a 5.56x45mm NATO chamber, which means that it can also fire the .223 Remington cartridge. The barrel has a total diameter of 0.85 inches, with a length of 16.1 inches and a 1:8 twist rate. The 1:8 twist rate in particular is worth noting because it means that it will stabilize a wide variety of different bullet weights. In fact, any 5.56 round with a weight of 35 up to 77 grains will fire through the AR-556 and maintain its accuracy. The only rounds that will not are those with the heaviest weights, such as 90 grains. 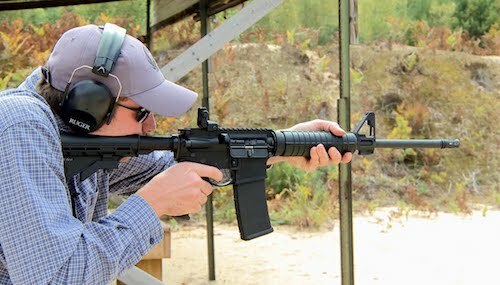 In contrast to this, the biggest competitor of the AR-556, the Smith & Wesson M&P15 Sport II, has a twist rate of 1:9, which stabilize a less wide range of bullet weights. The barrel of the AR-556 is further finished in matte block oxide. It also comes installed with a flash hider and bayonet lug at the end as well. The Ruger AR-556 utilizes a direct gas impingement system. This fact upset a lot of people, who felt that the piston system is superior since the unburned gases and powder are vented back into the action of the rifle with the direct impingement system, and obviously causes more fouling. In contrast to this, those unburned gases and powder are instead vented out of the front of the rifle with the piston system. That being said, there are also many other people who have no problems with the direct impingement system. So long as the gun is cleaned at regular intervals, it will work just fine. 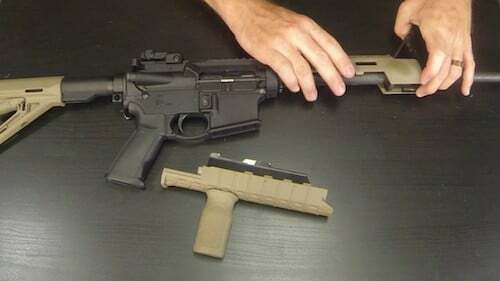 Furthermore, direct impingement AR-15s tend to be a little more accurate, have softer recoil, and also cost less (hence, almost all budget made AR-15s utilize the gas impingement system). AR-15s are known for having very light, crisp, and smooth triggers. In fact, it’s one of the biggest appeals of the platform. But Ruger firearms in general, on the other hand, are known for not exactly having the best triggers on the market. Ruger guns tends to be overbuilt like tanks and are among the most durable production firearms that money can possibly by. So this begs the question: how does the trigger of the AR-556 stack up? Needless to say, the AR-556 lacks the creepy and heavy trigger that have plagued a lot of Ruger products. This is because it has a single stage trigger with a consistent pull. While it is a tad heavier than several competing AR-15s, at an average weight of 7-8 pounds, you can’t complain if you’re buying an AR at this low of a price. Plus, it’s nothing that you can’t upgrade on your own later on. 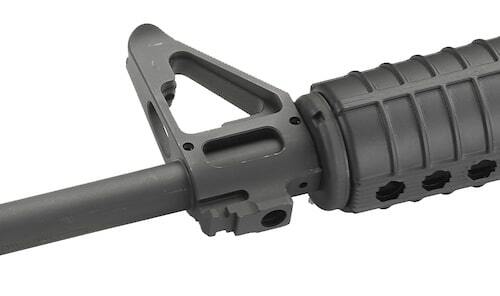 The AR-556 features a quick disconnect (QD) socket for adding slings and a bayonet lug. The bayonet lug may not be necessary, but it’s still nice to know that you have it if you ever want to use it in the future. Ruger also installed the AR-556 with a plastic handguard, and this is perhaps the weakest element of the firearm. Yes, this is a budget rifle, so it’s perhaps what you should have expected. But that being said, it is also rather ‘flimsy’ in contrast to other AR rifles. You would be best served by swapping it out with something more durable, such as a Magpul handguard. The upper receiver of the AR-556 is built using a 7075-T6 aluminum. This rifle also comes installed with a dust cover, brass deflector, and forward assist, which are features that many other budget AR-15s do not come with. For this reason alone, the AR-556 should be at or near the top of your shortlist of budget ARs that you are considering. Meanwhile, the flat top of the weapon features a 1913 Picatinny rail. The front sight is fixed into the barrel but is also adjustable, while the rear sight is a flip up sight with the Ruger logo on it. This rear sight can be removed if you so desire, and the 1913 rail means that it will be incredibly easy to add additional sights, optics, or lasers of any kind. There is absolutely no question that the AR-556 represents the pinnacle of the budget AR-15. This is because it is built to high standards, has performed very well in torture and endurance testing, and comes installed with numerous features that one would only expect to find on a higher priced model. For this reason, the AR-556 is the AR-15 rifle for anybody: a high quality firearm at a perfectly reasonable price. It’s a rifle that can be used by both enthusiasts and those who will only be shooting a couple times a year. No, it’s not a flawless gun by any means. The trigger isn’t sloppy, but it’s not the best AR-15 trigger either. And the front hand guards begs to be replaced with something sturdier and more durable. Still, how can you complain for an AR-15 priced at $500? And who says you can’t upgrade any of those things yourself? Read our AR15 scope reviews to check out our detailed product breakdown. Out of all the budget AR-15s on the market, the AR-556 is one of the very best there is. I have the Ruger MPR 556, which has many of the same specs as the AR 556. I have owned this rifle for about 3 months and have put about 500 rounds through it. Not one misfire, not one jam on the eject, no malfunctions whatsoever. I got the MPR because it just looks a lot meaner than the AR 556. I paid $599 for the MPR on sale from a regular price of $899. Couldn’t be happier.